The Arctic is currently experiencing a heat wave with temperatures forecasted to be more than 20 ºC above normal, following a very warm November and December. Such a heat wave has dramatic consequences for the local ecosystem and is also a striking example of how climate change is impacting the world today. Historical temperature records reveal that the Arctic is warming more than twice as fast as the rest of the planet. Still, the recent heat and record-low sea ice for this time of the year are extreme departures from what has become normal now. As part of the World Weather Attribution (WWA) team CPDN scientists have looked at observational data and model simulations, including weather@home to identify whether and to what extend human-induced climate change influenced the likelihood and magnitude of this extreme event. The results the team found are that human-induced climate change is intensifying both the heat in the Arctic and increasing the frequency of such unusually warm periods. The analysis revealed that the temperatures experienced this November and December in the Arctic would have been extremely unlikely before the pre-industrial, pre-global warming days of the 1800s. This current North Pole heat event is still a rare occurrence — roughly two percent chance every year — even in our warmer world of today. 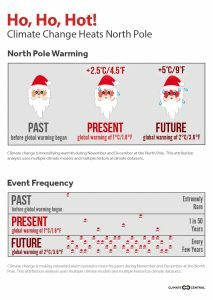 Looking into the future, we found that, if nothing is done to slow climate change, by the time global warming reaches 2 ºC events like this winter would become common at the North Pole, happening every few years. Read the full analysis here.